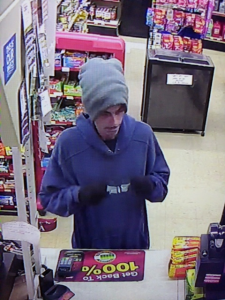 The Pickens County Sheriff’s Office is currently investigating an Armed Robbery that occurred at Griffin Grocery located at 1804 Pumpkintown Hwy on September 14, 2018. Surveillance video collected during the investigation confirms that at approximately 6:15pm, a white male believed to be in his late 20’s or early 30’s walked into the business and presented a dark colored, semi-automatic handgun while demanding money from the clerk. The man was given an undisclosed amount of money from the register and was last seen exiting the store on foot. There were no shots fired and no injuries were sustained by any party. At the time of the robbery, the male was wearing a grey stocking cap, sunglasses, a blue or purple colored hoodie, white tennis shoes, and black gloves. A still image from the video has been attached to this release and the Sheriff’s Office is asking anyone that may have information regarding the identity of the suspect to please call the Sheriff’s Office at (864) 898-5500 or Crimestoppers at 1-888-CRIMESC. The Pickens County Sheriff’s Office received a request for assistance from a Liberty resident in the area of Black Bottom Rd after she was bitten on the finger by a young kitten. A deputy from the Sheriff’s Office Animal Enforcement Unit responded out to the residence on September 07, 2018, at which time the homeowner advised that a skunk had previously come onto the property and killed several cats and kittens. The skunk later died on her property. Several days passed and the homeowner was attempting to handle one of the surviving kittens after noticing that it appeared to have difficulty in maintaining its balance. As she was in contact with the kitten, it started to act violently and bit the woman on her finger breaking the skin. The kitten was captured and taken to the Pickens County Animal Shelter where it was euthanized and forwarded to DHEC for testing. This week the Sheriff’s Office was notified by DHEC that the animal did test positive for rabies. The homeowner was immediately notified and she proceeded to receive the prescribed treatment for potential exposure to the disease. The Sheriff’s Office is not aware of any other danger to the community since the skunk is no longer alive and no longer roaming the area. The kitten did not appear to have any visible wounds from the skunk; however, transmission of rabies can often occur from animals that have access to the same food or water bowls. The Sheriff’s Office encourages anyone that observes any wild animal that is acting strange or appears to be suffering from an unknown illness to avoid contact if at all possible and to use extreme caution with personal pets until they have been examined by a veterinarian.